During the course of a career, every actor will either see their name linked to proposed projects that fail to materialize or be involved in projects which collapse. Bela Lugosi was no exception. From roles in films, plays and on TV to novels and records, this page offers a tantalising glimpse of what might have been. The following is an incomplete list. It will be added to as more details are uncovered. The Red Poppy opened at the Greenwich Village Theater on December 20, 1922. The ill-fated production lasted for only thirteen performances over a ten-day period. Financial problems are said to have caused the production to fold when the cast were not paid. 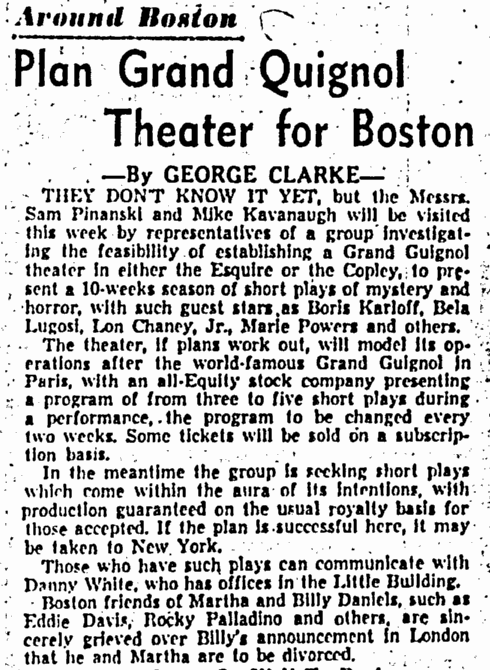 The press announced that the play would re-open at the Nora Bayes Theater on January 8, 1923. No evidence has been unearth to show that this actually happened. Records of the Nora Bayes Theater show no productions staged between January 7 to March 11, 1923. “The Red Poppy,” with Estelle Winwood, recently at the Greenwich Village Theatre, will reopen at the Bayes tomorrow night. Henry Barron will move his comedy drama, “The Red Poppy,” by Picard, to the Nora Bayes Theatre tomorrow night, retaining the original cast, which is headed by Miss Estelle Winwood. Hollywood, March 31. 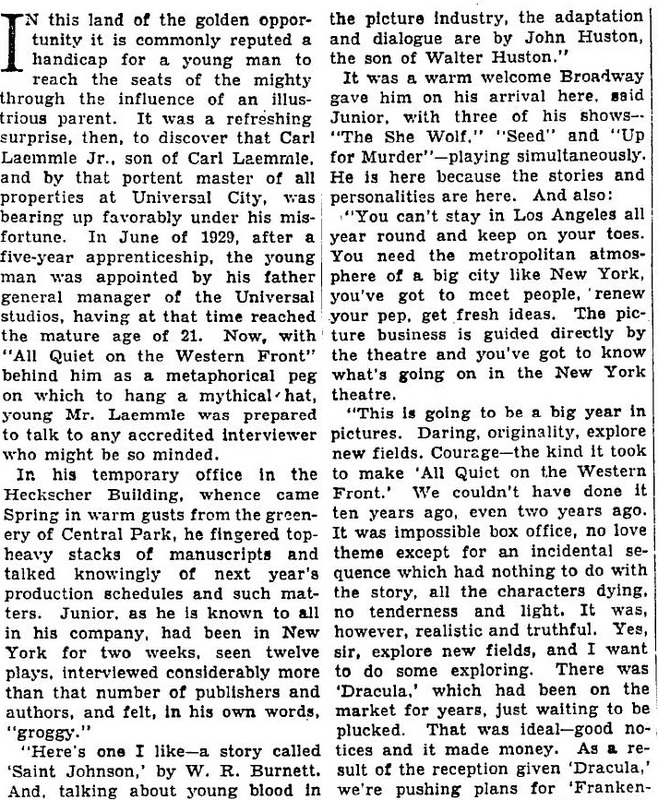 On returning from Honolulu, where he went in place of Warner Oland on Fox’s “Black Camel,” Bela Lugosi will probably sign with Universal on a term contract. Lugosi’s success in “Dracula” is the principal reason for U’s wanting him. The studio has other parts in mind, one of them being in “Frankenstein,” medical melodrama. 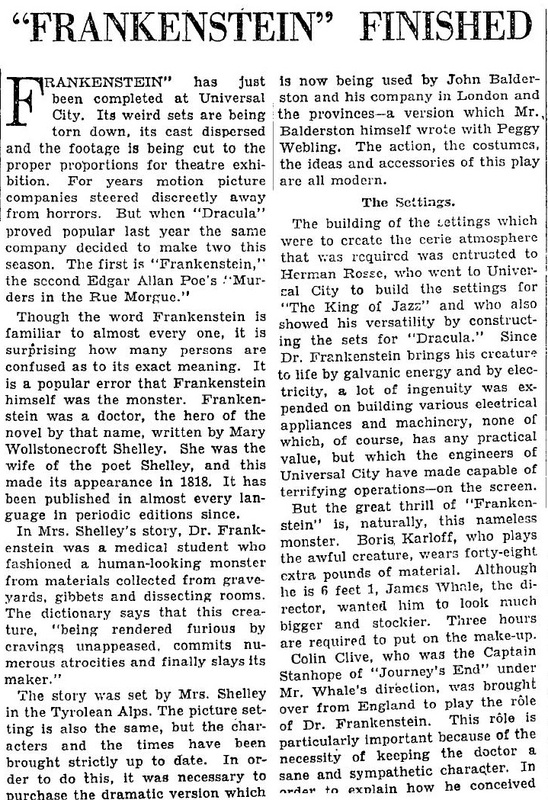 THE air at Universal City is thick with rumors about the contemplated productions of “Frankenstein” and Poe’s “Murders in the Rue Morgue.” The real news, though, is limited to the announcement that Bela Lugosi, who played the title role in “Dracula,” will have the lead in Mary Shelley’s macabre story and probably also in the Poe story. Bela Lugosi, the star of the screen version of Dracula, will play the principal role in Frankenstein, another thriller, and perhaps in The Murders in the Rue Morgue. Having made a success of “Dracula,” Universal is going in strongly for macabre subjects. They recently purchased the rights to “Frankenstein,” a blood-curdler now being played on the London stage, and “The Murders in the Rue Morgue,” Edgar Allan Poe’s horror melodrama. Bela Lugosi, who did so well with the role of Count Dracula, has been assigned the leading role in “Frankenstein.” At present Lugosi is en route to Honolulu where he will join the “Black Camel” company in an important role. Bela Lugosi will be kept in nightmare parts similar to that in “Dracula.” Universal has readers looking for more parts of that type for Lugosi, the readers rummaging through old stories. Studio already has “Frankenstein” for the actor. The continuous triumphs which have been scored by Bela Lugosi in the title role of “Dracula” have resulted in him signing a long term contract with Universal. This will insure his appearance in “Frankenstein,” the successor to “Dracula” in next year’s Universal lineup. Bela Lugosi has been put under a long-term contract by Universal. He will put on the make-up for Universal’s “Frankenstein,” after which he will do the leading role in Murders in the Rue Morgue,” adapted from Edgar Allen Poe’s short story of the same title. Bela Lugosi came back to a surprise after three weeks spent in Honolulu with “The Black Camel” company. His manager signed him on an advantageous long term contract with Universal while he was away. 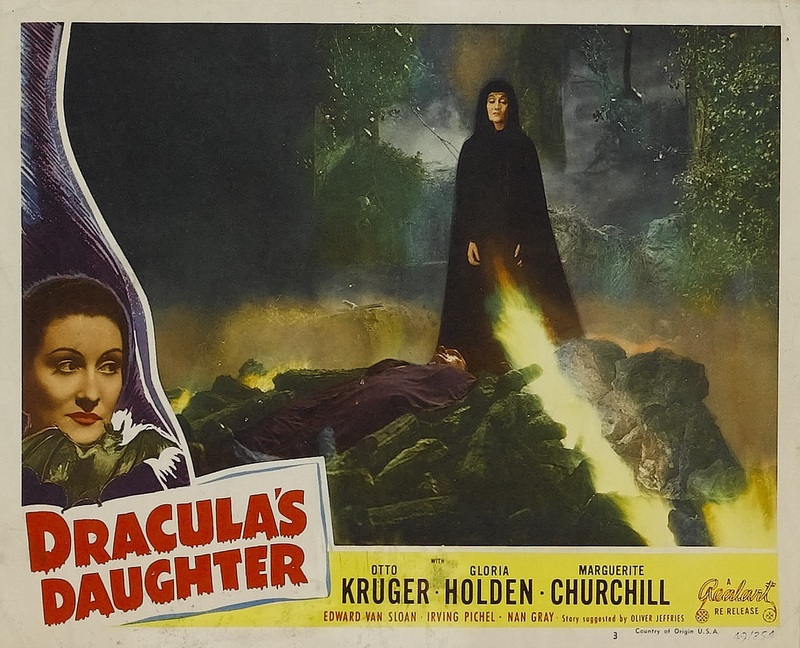 He starts immediately on “Frankenstein,” which will be followed by “Murders in the Rue Morgue.” By the time these two are finished the reading department expects to have some more horror tales run down for the man who made “Dracula” a household word. Bela Lugosi knows what hard work is. He is finishing The Black Camel, and Universal is waiting for him to start shooting on Frankenstein. “I like to be busy,” he says. “Nothing creates such a joy of living as being active. I recall the dull times when I first came to Hollywood, and producers did not know me, and I rejoice each morning that I hear the early alarm. SOMETHING has got to be done for Bela Lugosi. Lugosi has been trying for a week to make a screen test for “Frankenstein.” He has to wear a weird makeup, with two or three different colors, stripes, streaks and striations. But after a few blasts of hot air, the makeup all fuses together, making him a clown instead of a menace. 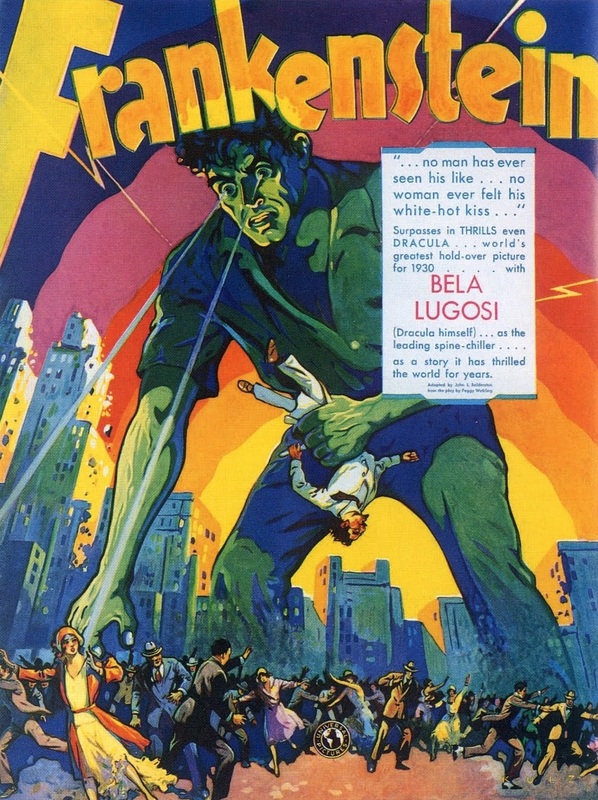 Bela Lugosi begins work soon on “Frankenstein,” playing the name role at Universal. He is now studying makeup for the part. HOLLYWOOD, June 27 (A.P.) – What probably will be one of the trickiest jobs of makeup since “The Hunchback of Notre Dame” will be seen when the picture “Frankenstein” is released. 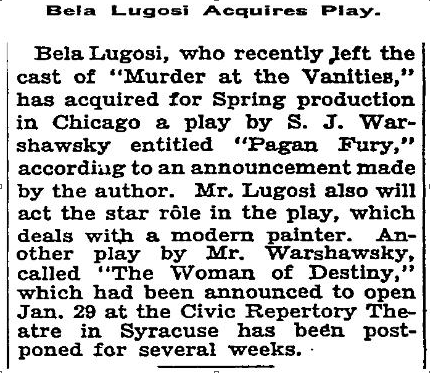 Bela Lugosi, in the starring role, will be built up with makeup and padding, to resemble the eight foot superman Mary Goodwin Shelley, wife of poet Percy Shelley, wrote about in 1817. When Lugosi is made up only his chin and eyes will be visible, grease paint and putty completely hiding the rest of his face. Shoes to which nearly 12 inches have been added will help complete the illusion. Mrs. Shelley’s fantastic story concerns the creation by a medical student of a man monster. You can almost imagine what happens when this ruthless giant sets out to have a little fun. Another film for fall release should be less disquieting than “Frankenstein” but hair raising nevertheless, is Poe’s “Murders in the Rue Morgue.” It is being changed a great deal from the original in order to bring in a romance. Its adaptation is being written by the Russian Leo Birinski, who has written “Variety” and “Mati Hari” for the movies. Birinski believes that motion picture audiences want to see people in idealistic situations, so he is trying to combine his theory with those of Hollywood, the latter consisting of picturing everything as it really is – or almost so. As a result of his work on “Waterloo Bridge,” Universal has taken up the option clause in James Whale’s contract. His next will be “Frankenstein,” with Bela Lugosi. James Whale has been assigned by Universal to direct “Frankenstein” next. Garrett Fort has made the adaptation. Bela Lugosi heads the cast. LUGOSI, BELA; unmarried; born in Lugos, Hungary. Write him at Universal studio. Contract star. Title role in “Dracula,” Universal. Tarneverro in “The Black Camel,” Fox. Tutle role in “Frankenstein,” Universal. There’s been a lot of conjecture in Hollywood about who would take the place of Lon Chaney on the screen. Lionel Barrymore and Wallace Berry have been mentioned. It’s natural that Metro, where Lon finished his career, should hunt for the successor. But it’s natural, also, that Universal, where Lon started, should be in the running. And Universal’s choice is Bela Lugosi who made “Dracula” a real box-office wow. Now in “Frankenstein” he’s playing the part of an “unborn” man – one designed by science, an eight-foot monster without sentiment. And only his chin and his eyebrows are to show on the screen. The Universal production of Mary Shelly’s “Frankenstein” is taking shape under the knowing guidance of James Whale. 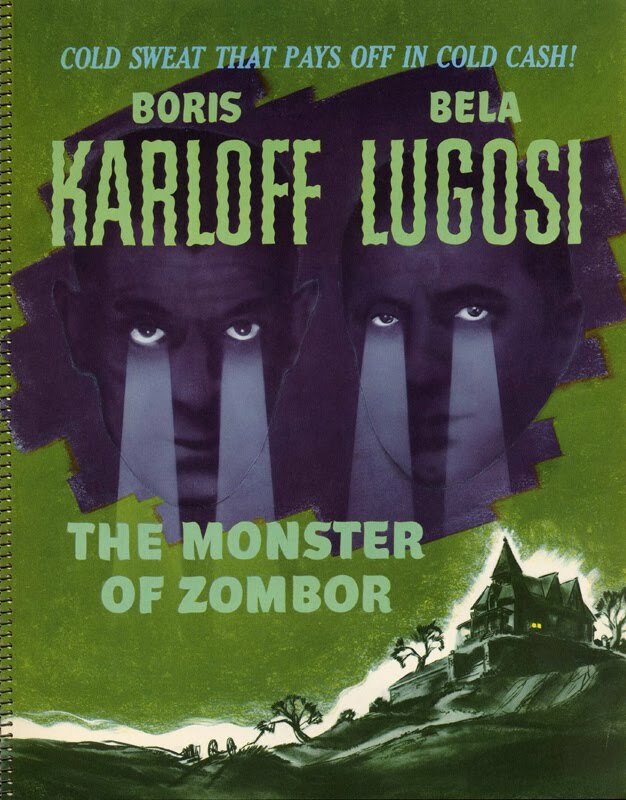 Boris Karloff and not Bela Lugosi is the final choice to play the monster. Colin Clive has been imported from England to play the role of Frankenstein, the student who builds the semblance of a man out of bits of human wreckage and then, by an extraordinary light ray, endows the creature with life. This was a role which Lon Chaney all his life was anxious to play. Mae Clarke is the tentative choice for the role of Elizabeth. Frederick Kerr will appear as the Baron, Edward Van Sloan as the Professor and Dwight Frye as the Dwarf. John Boles, now recovered from the mishap which kept him out of “Strictly Dishonorable,” has been assigned the role of Victor. There’s been a lot of conjecture in Hollywood about who would take the place of Lon Chaney on the screen. Lionel Barrymore and Wallace Beery have been mentioned. Universal’s choice is Bela Lugosi who made “Dracula” a real box-office wow. Now in “Frankenstein” he’s playing the part of an “unborn” man-one designed by science, an eight-foot monster without sentiment. And only his chin and his eyebrows are to show on the screen. The Grand Old Man of the Producers and some of his henchmen. 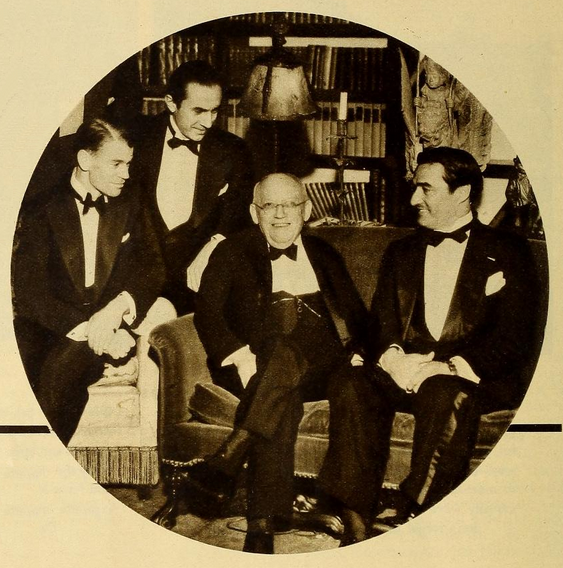 Left to right: the director, James Whale, Bela Lugosi, Carl Laemmle, and Tom Mix. 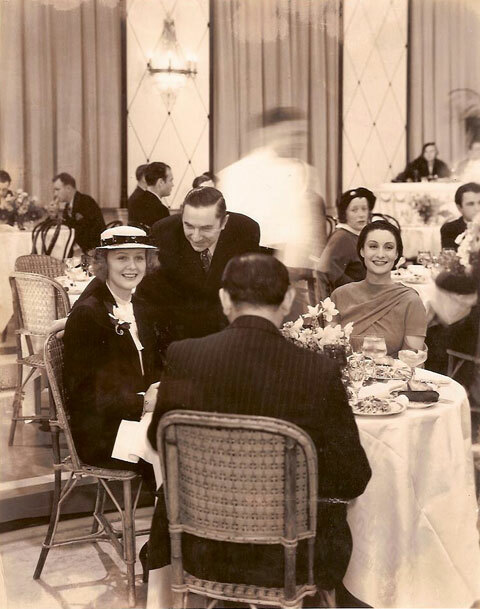 HOLLYWOOD (UP) – Among the hazards of filmland is makeup “jitters,” the inability to sit still for hours at the time while experts apply the cosmetics and other tricks of their calling. Although this may seem only an inconvenience to some people, the torture was so great for one actor that he lost the chance to gain world fame as a “horror” star. Bela Lugosi, a Hungarian actor who had appeared in many mystery and horror plays on the stage, was to have had the role of the monster. But the part called for him to spend six hours daily having his makeup applied. And Lugosi could not stand the strain. So Boris Karloff, who had been playing supporting roles in pictures for many years was given the part and became Hollywood’s leading horror-man, while Lugosi was forced to play more or less straight roles. Universal is giving serious consideration to making the “Hunchback” into a talker special. Bela Lugosi is chiefly responsible, that actor being figured the next best to Lon Chaney who played the title role in the silent version. The picture was U’s greatest money maker. “Notre Dame” as a talker will probably be at least 50% new and more than that unless a continuity can be devised which would lend itself to proper editing. “The Miracle Man,” made more than a dozen years ago, is the picture which “made” three stars at once – Thomas Meighan, in the role of the smooth racketeer, Betty Compson as his beautiful accomplice, and Chaney. George Bancroft has been mentioned for the Meighan role in the new talking version. Another star who falls heir to a Chaney role in the current epidemic of re-makes of popular silent films is Bela Lugosi, who may do a talking “Hunchback of Notre Dame” after his success as the weird “Dracula” and his work in “Murders in the Rue Morgue” and “Frankenstein,” yet to be seen. 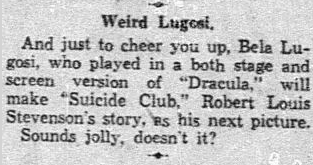 The Suicide Club, based on a story by Robert Louis Stevenson, was announced in the press as a vehicle for Bela Lugosi. In 1934 the idea was revived by Universal as a vehicle for Bela Lugosi and Boris Karloff in the wake of their successful pairing in The Black Cat (1934). Although pre-production promotional artwork was published, the film remained unproduced. Lugosi, Bela; unmarried; born Lugos, Hungary, October 20. Universal contract player. Featured role in “Murders in the Rue Morgue.” Working in “Suicide Club.” For Universal. The Messrs. Wee and Leventhal are spending a large part of their time examining plays that might do for The Menace, Bela Lugosi. They are also thinking of a musical version of “Six-Cylinder Love,” the William Anthony McGuire play in which Ernest Truex appeared…. 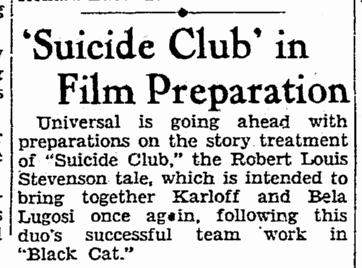 The Suicide Club, based on a story by Robert Louis Stevenson, was first mention as a project for Bela Lugosi in 1932. Following the successful teaming of Bela Lugosi and Boris Karloff in The Black Cat (1934), the idea was revived as a another vehicle for the two stars. Although pre-production promotional artwork was published, the film was never made. 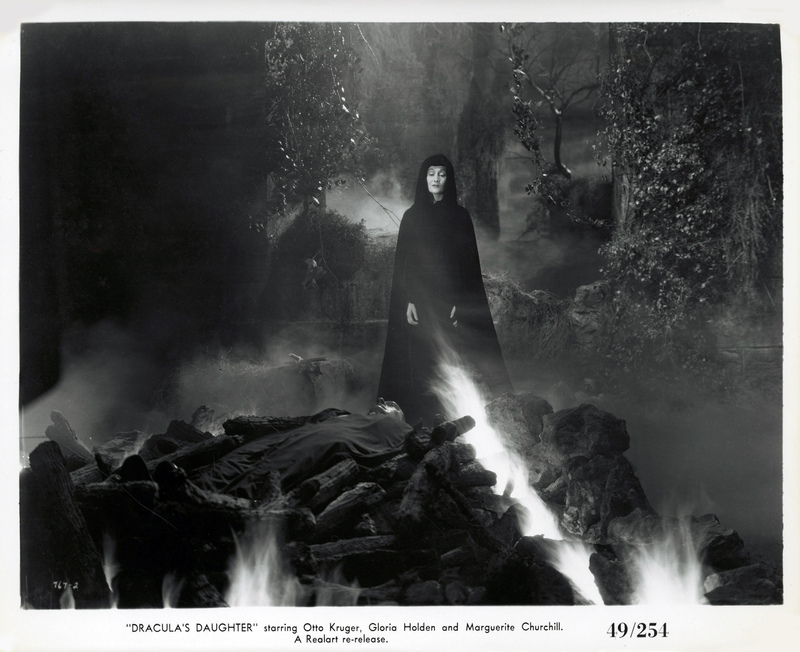 The Return of Frankenstein was an early title for The Bride of Frankenstein. Lugosi was slated to play a similar role to that eventually played by Earnest Thesiger. SO well, are those two eminent screen ‘monsters,’ Boris Karloff and Bela Lugosi, working together in ”The Black Cat’ that Universal have decided to turn them into what will be the first ‘horror team’ in screen history. Two stories have already been set aside for the attention of Messrs. Karloff and Lugosi. They are ‘The Suicide Club,’ a version of Robert Louis Stevenson’s celebrated romance, and ‘The Return of Frankenstein.’ While Mr. Karloff is, of course, an Englishman, Mr. Lugosi is an Hungarian who learned English to play Dracula on the stage and on the screen— a part which made him famous. 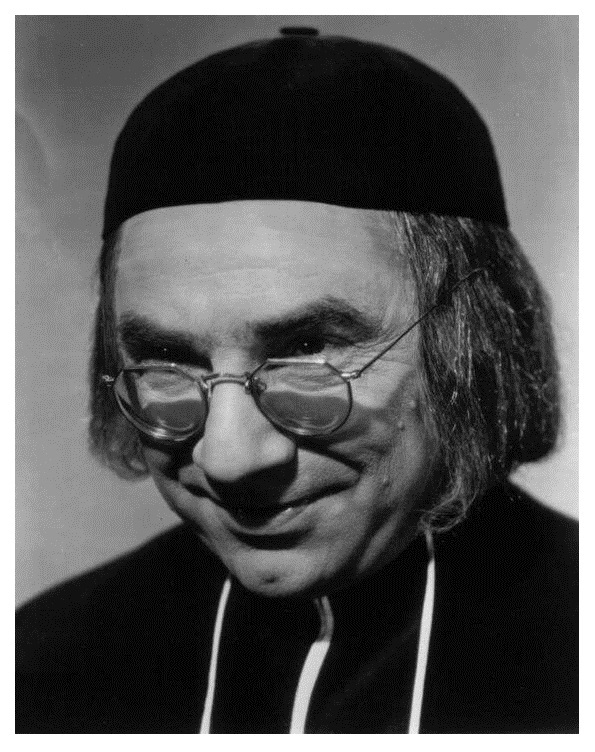 Referred to as either Fiarri or Ferrai in the press, the Earl Cortis-scripted play, another production earmarked by Bela Lugosi’s Belian Productions, was to have been directed by Jack Linder. It remained unproduced. Mystery stories are what the public wants, Donald Friede (l.), member of the Covici-Friede publishing firm of New York City, tells Bela Lugosi, film star famous for his delineation of horror roles. Friede, on a literary scouting trip to Hollywood, has signed Lugosi for a mystery-horror yarn which is expected to keep readers a-quiver when it appears in the near future. This photo shows them perusing Lugosi’s preliminary manuscript. In 1935 Lugosi and his friend Manly Hall tried to interest Warner Brothers in several projects which Lugosi hoped would showcase his talents as a classically trained actor. 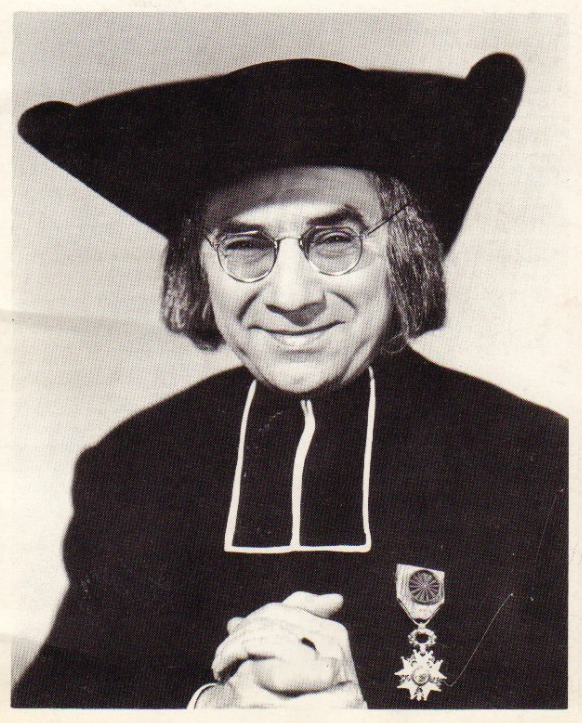 Hall produced treatments for Emperor of Atlantis, Faust, in which Lugosi was to play Mephisto, and The Mysterious Abbe, which was to star Lugosi as a crime-solving French clergyman. Warner Brothers were interested enough in the idea to conduct wardrobe tests, but later dropped the project. Topped with a popular cast, “The House of a Thousand Candles” has gone into production at the Republic studios in Hollywood. Leading roles will be played by Phillips Holmes, Mae Clarke and Bela Lugosi. 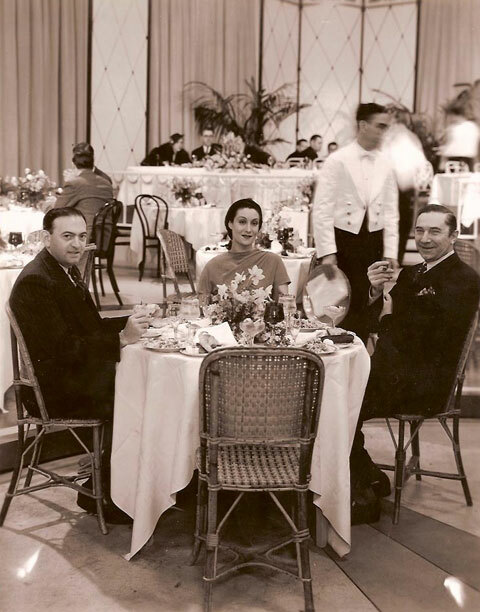 Others playing important roles in this Republic picture include Rosita Moreno, Fred Walton and Lawrence Grant. Mischa Auer, Hedwig Reicher and Olaf Hyttten have been added to the cast of “House of a Thousand Candles,” Republic production featuring Bela Lugosi, Mae Clarke and Philips Holmes. Arthur Lubin is directing. Fighting a bad cold throughout the first week of production, Bela Lugosi was finally forced to withdraw from the Republic feature, “House of a Thousand Candles,” when complications set in. Irving Pichel has been signed to replace Lugosi. 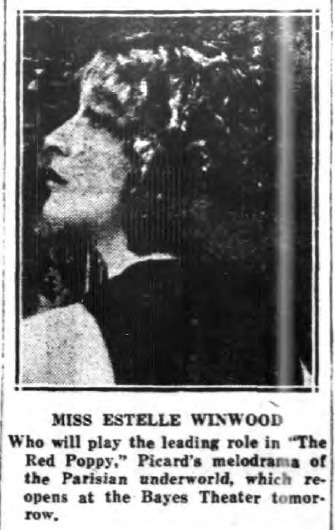 Influenza kept Lewis Stone in bed two weeks, jerked Bela Lugosi out of “The House of a Thousand Candles,” and sent Gertrude Michael back to bed. Bela’s involvement with Dracula’s Daughter was first mentioned in the press in 1934. His image featured prominently in concept artwork. 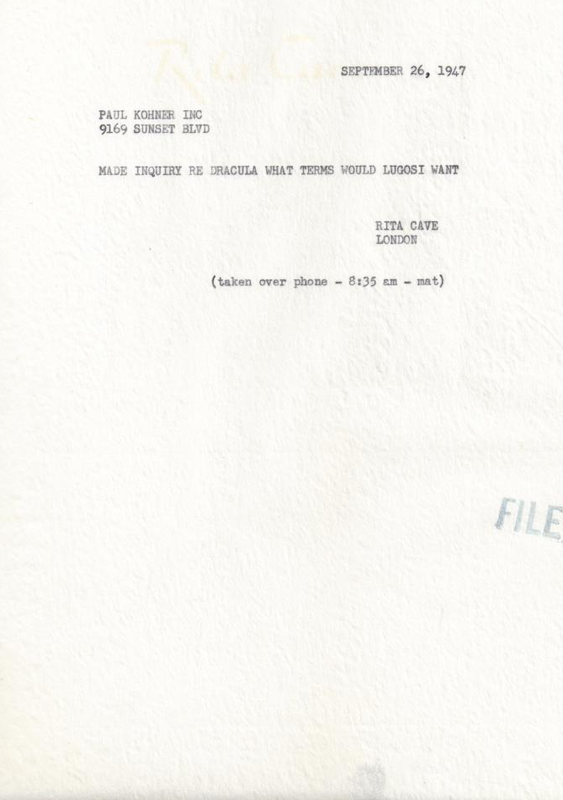 Early drafts of the script, which would have explained Dracula’s origins, were abandoned because of censorship issues. Despite a lack of written confirmation, it has been speculated that Bela was paid as around $4,000 for his cancelled involvement in the film, but the only financial record to have been uncovered is a letter in which Bela agreed to the use of his likeness at no cost to create the unconvincing wax bust which featured in the film. 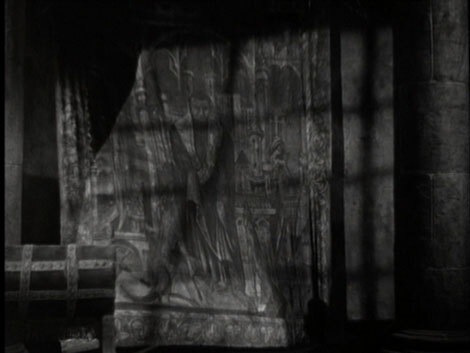 A tapestry briefly seen in Dracula’s castle bearing Bela’s image is all that remains of R.C Sheriff ‘s original script, which explained how Count Dracula was transformed into a vampire by a wizard. Don Terry is set in hero spot for Columbia’s 15-spool serial, The Secret of Treasure Island, starting Monday under direction of Elmer Clifton. Cliffer deals with adventures of a newspaper reporter. Grant Withers and Bela Lugosi also are prominently in the cast. Femme lead is yet to come. 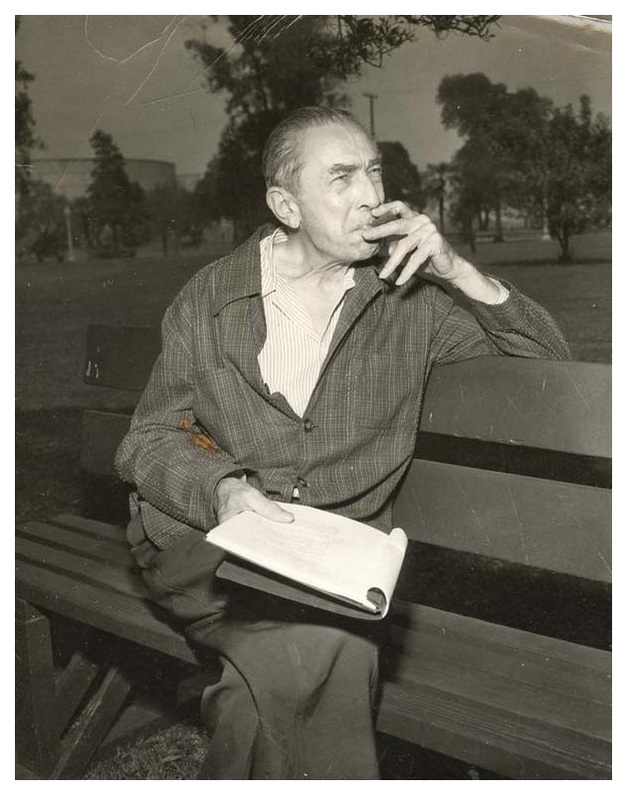 Bela Lugosi bought the rights to The Howling Death, A werewolf story written by Barkley Davis, and co-wrote The Sect of the Assassins with Davis. In a 1948 interview Bela Lugosi spoke of his regret at turning down the lead in the play Angel Street. The play, which was originally called Gas Light when it premiered in England, premiered on Broadway at the John Golden Theatre on December 5th, 1941 with Vincent Price in the leading role. Movieland’s No. 1 horror will narrate and star in a series to be launched next Tuesday night at 10:30 following an otherwise grand evening of swell comedy. To give it as bloodthirsty a beginning as he can think up he has chosen for his first broadcast “The Voice of Death,” the story of the voice of a dead man which guides his widow to the commission of murders by wholesale. After that Mr. Karloff will summon Bela Lugosi, Peter Lorre, Laird Cregar, Raymond Massey and other “partners in crime” to the mike, to make things as bad as possible, in a spooky sort of way. Mark down as sucker No. 1 for mystery stories this guy, who’d give up his sleep for a Karloff broadcast. There’s a new chiller series on WROK-Blue every Tuesday night at 9:30. Boris Karloff is starred in “Creeps By Night.” Karloff’s guests in weeks to come include Bela Lugosi, Laird Cregar and Peter Lorre. A new series of stories, taken from the book, The World’s Finest Mystery Stories, edited by Dashiell Hammett, will be presented over the Blue network starting Tuesday, and will be heard over the Dominion network of the CBC and carried by CKRC at 9.30 p.m. Entitled Creeps by Night, this series features Boris Karloff, and a cast drawn from the top ranks of radio actors. 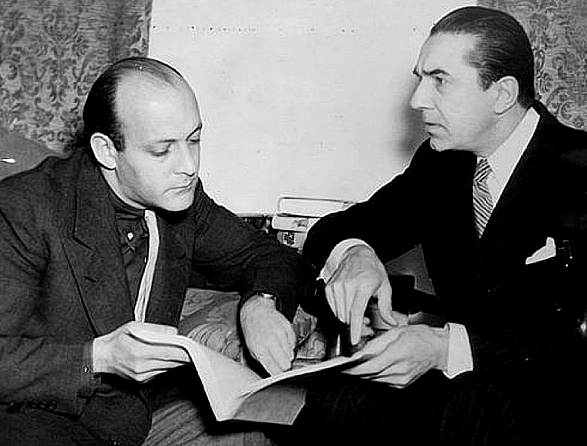 During the following weeks, guest stars such as Bela Lugosi, Peter Lorre. Laird Cregar, Raymond Massey and others will appear on the programme. This production is not believed to have taken place. NEW YORK, July 30. – Bela Lugosi, who makes with the eyes in the blood-chilling B flickers, is being submitted for theater dates. He’s currently working on a new routine with Don Marlowe who will appear with him. Understood he’s penciled in at Loew’s State. Can London take it? Bela Lugosi is sailing for England shortly to revive his famous “Dracula” role there. Bela Lugosi swears Brain of Frankenstein will be his last horror picture; but he will have one more fling at Dracula on the London stage. Then, of all things, he will do four weeks of Harvey. 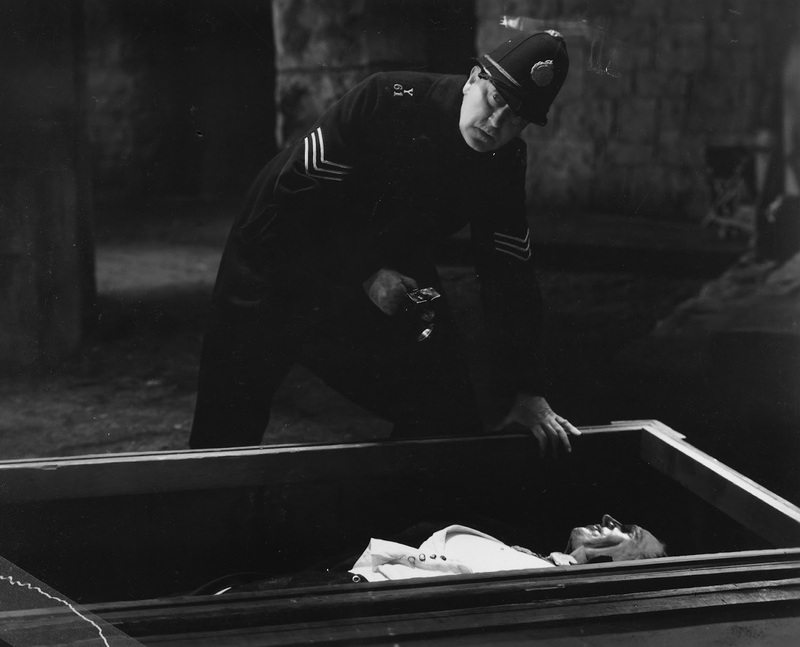 That can only be matched by Boris Karloff, another horror man, who did kindly old Gramps in On Borrowed Time last year. Bela Lugosi leaves April 15 for London to open a revival of “Dracula”. HOLLYWOOD – (AP) – Two of the screen’s ablest boogymen, Bela Lugosi and Lon Chaney, are planning projects to satisfy the most eager of horror fans. Both are currently scaring the wits out of Abbott and Costello in “A. and C. Meet Frankenstein,! 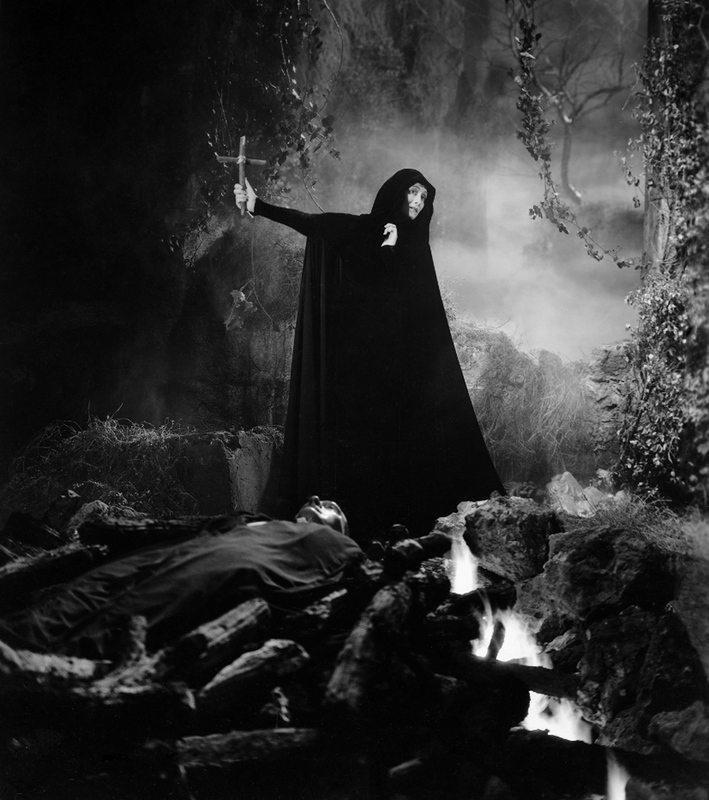 and Lugosi reports that U-I is mulling two subjects based on his “Dracula” portrayal. “There is enough material in the original novel for half a dozen pictures,” the Hungarian actor told me. Meanwhile, he plans to take the famed blood-sucker to London for an eight-week stage run this summer. Chaney is organizing his own producing company with Curt Siodmak, top writer of gruesome scripts. They plan to create new characters “more horrible than any yet seen on the screen.” I can hardly wait. Promised but not hoped for: A remake of “Dracula,” starring Bela Lugosi. Hollywood, Mar. 4—(AP)—Bela Lugosi plans to play in Harvey next fall. “I will give a slightly different interpretation of the role,” he said, uttering the understatement of the week. A vampire film with Bela Lugosi Jr. 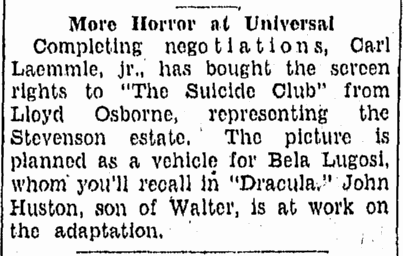 Gruesome note: Bela Lugosi will appear in a film with his young son, who will play a brat-aged Dracula. 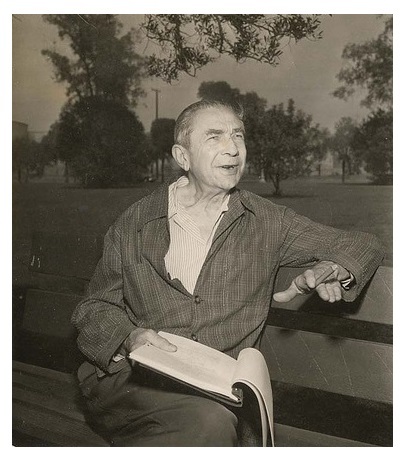 In an interview for the Springfield Union, Lugosi spoke of his hopes to appear in a play called Magic on Broadway and a second film with Abbott and Costello. HOLLYWOOD, April 16. – Hampton White, former leading man with the Lend an Ear company on the West Coast, has been signed to do the leading role in a road company of Bela Lugosi’s Dracula. White formerly did leads with Brunk’s Comedians in Texas and for two years appeared with Captain Reynold’s Majestic Showboat on the Ohio River as a leading man. Following the road tour of Dracula, White will go into Lugosi’s picture, Strange Deception the first feature film to be made in third dimension. HOLLYWOOD, July 9. – Top talented tele shows, developed and packaged by the William Morris Agency, will be made available at bargain rates to local video ops and bankrollers under a kine audition plan currently being set up. Designed to give lively network tele prospects a test run and kine audition, the Morris office will spotlight shows locally at “below cost” rates, seeking in return only guarantees of good production and quality kines. Agency thus hopes to build a library of kined audition films which can be used by sales staff in peddling shows to national bankrollers. To be called Surprise Theater, stations or bankrollers will be taxed only for the actual cost of sets, costumes and production, plus a probable minimum talent fee. Name talent will waive usual high fees thus enabling the station to carry the series as a prestige sustainer or to peddle to bankrollers as a low-cost packaged deal. Among shows earmarked for Surprise Theater are packages featuring following Morris office clients: Billie Burke, Sterling Hollaway, Zasu Pitts, Marcy McGuire, El Brendel, Bela Lugosi, Pinky Lee and Actors Lab and Pasadena Playhouse dramatic orgs. All shows will be one-showing deals only and the Morris office retains exclusive rights despite preem test runs. KNBH Set To Air Wm. Morris Pkg. HOLLYWOOD, July 9. – Deal was set this week for KNBH, National Broadcasting Company (NBC) Coast tele station to beam the William Morris Agency packaged series, Surprise Theater, beginning late in August (The Billboard, July 16). Agency will provide the video outlet with top talent packages at no cost to KNBH, with station assuming only production charges. Morris office will kinescope each show for audition and sales purposes, using KNBH facilities for showcasing proposed commercial segs. 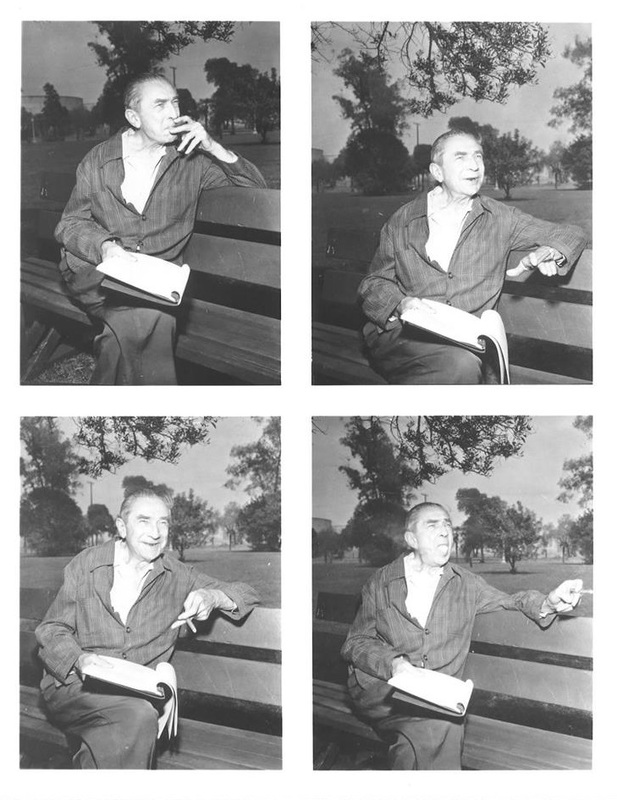 At least 15 different packages will be aired during half-hour weekly slot, including shows featuring such names as Zasu Pitts, Pinky Lee, Bela Lugosi, Billie Burke, Sterling Hollaway, El Brendel and Marcy McGuire. If charged regular commercial kine rates, shows would cost Morris $250 a frame for recording facilities; if kine is provided at cost, nut will be even cheaper. 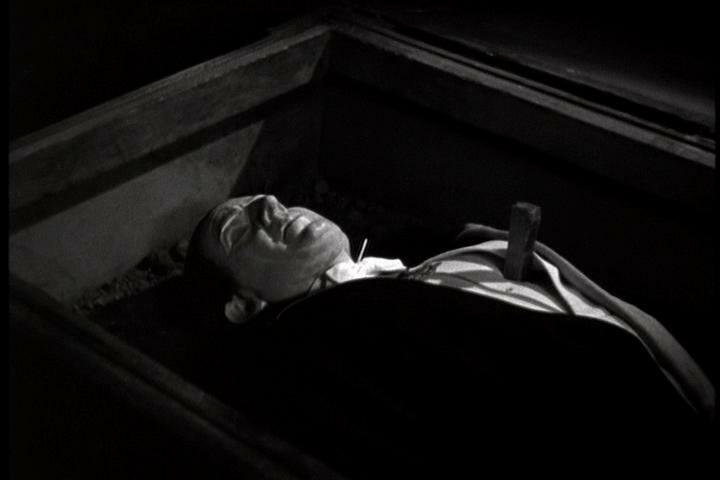 Bela Lugosi being dickered for Australia and offered year’s work to open at Sydney with “Dracula” sometime in January. Channel Chatter: Bela Lugosi is back un the U.S. after a long stay in England and will face the TV cameras in a new horrors-and-shivers series. Hollywood, Cal. (NEA) – Boris Karloff and Bela Lugosi, whose blood-curdling movies grossed a fortune for Universal, are being re-teamed in two horror films to be produced in London by George Minter. Horror fans eager for a reteaming of Boris Karloff and Bela Lugosi can stop having those nightmares. Neither Boris or Bela are eager for it. 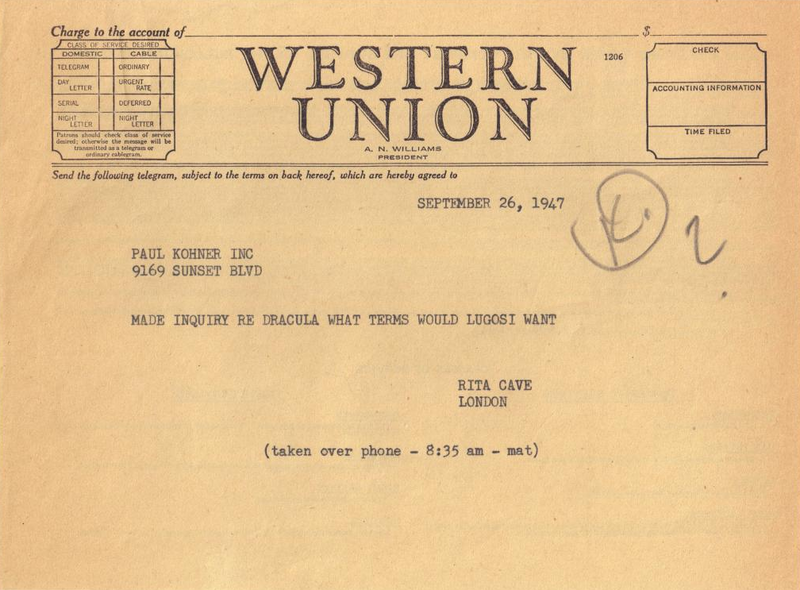 In June 1952, Lugosi told reporter Bob Thomas that he was to return to England to make an un-named film, possibly a sequel to Mother Riley Meets The Vampire, which he made during his almost eight months in England during 1951 after touring in a revival production of Dracula. Hollywood, Calif. – (AP) – Like his fellow horror expert, Boris Karloff, Bela Lugosi is a courteous, soft spoken fellow who takes his craft seriously. He fell into the horror line quite by accident. He was a romantic star of the Royal theater in Hungary, playing the original roles in such Ferenc Molnar plays as “Liliom” and “The Guardsman.” But he came to New York in the chiller “Dracula.” When he re-created the role in films, he was destined to a career of scaring people. Since he had played everything from Shakespeare to Byron, I asked if he objected to being typed. “No, not at all,” he replied. “The main thing for an actor is to keep working. And I have managed to do so for a good many years. It is a kind of security, this being a horror man. I have just returned from playing ‘Dracula’ in England for eight months. I also made a picture over there. “I have appeared on television with Milton Berle and a dozen other shows. Now I am filming ‘Bela Lugosi Meets the Gorilla Man,’ which is not bad publicity. I am to return to England for another picture and I am talking about a television series. So you can see I have been busy. “They wanted me to play the part of Frankenstein’s monster,” he recalled. “I even did a test for it. The make-up was terrible, with the rubber mask and putty and the padding choking my body. Then I saw the script. I didn’t have a line in the whole picture!. “I didn’t want to do it. I figured they could get any truck driver to put on all that stuff and grunt through the part. So I told them I wouldn’t do it. At first they were angry, and then I told them my doctor advised against such a strenuous part. Lugosi stayed at Universal for several years, playing in other horror films and co-starring with Karloff in many of them. He said that several years ago the studios weren’t making horror films, so he went to the east to live. He performed in plays and in vaudeville. 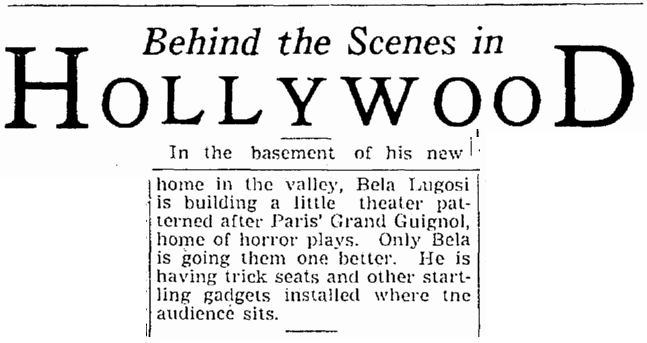 Now horror seems to be blossoming forth in Hollywood again, and Lugosi is again a California resident. He may build a home for himself, his wife and their 14 year old son. I asked him if people expect him to scare them in private life. “Sometimes,” he answered, “But they are generally good natured about it. For instance, children will come up and say, ‘Hello, bogey man.’ But they aren’t really frightened. Children know when someone is gentle, no matter what he is made out to be. The Phantom Ghoul, later referred to as The Ghoul Goes West, was a proposed Ed Wood vehicle for Bela Lugosi. 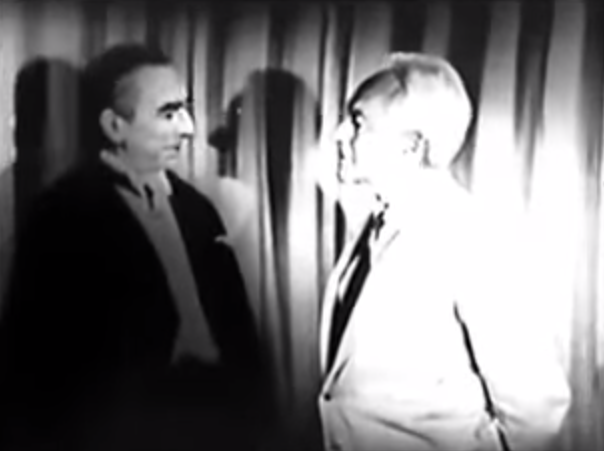 In an appearance on the You Asked For It TV show on July 27, Bela Lugosi told host Art Baker that he would shortly be filming The Phantom Ghoul in 3D. The brainchild of Ed Wood Jr, Dr. Acula was a proposed TV series which was never realised. Bela Lugosi spoke about it during an appearance on the You Asked For It TV show on July 27. J. Arthur Rank is the producer, and he told Lugosi that the original “White Zombie” they made together had been one of his company’s big moneymakers throughout the world. 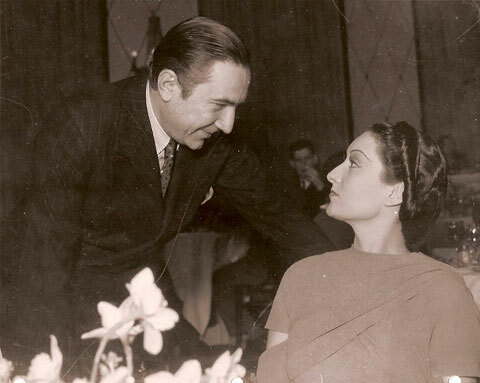 For the past year, Bela has been playing “Dracula” on the London stage and returned to Hollywood for just a brief time. 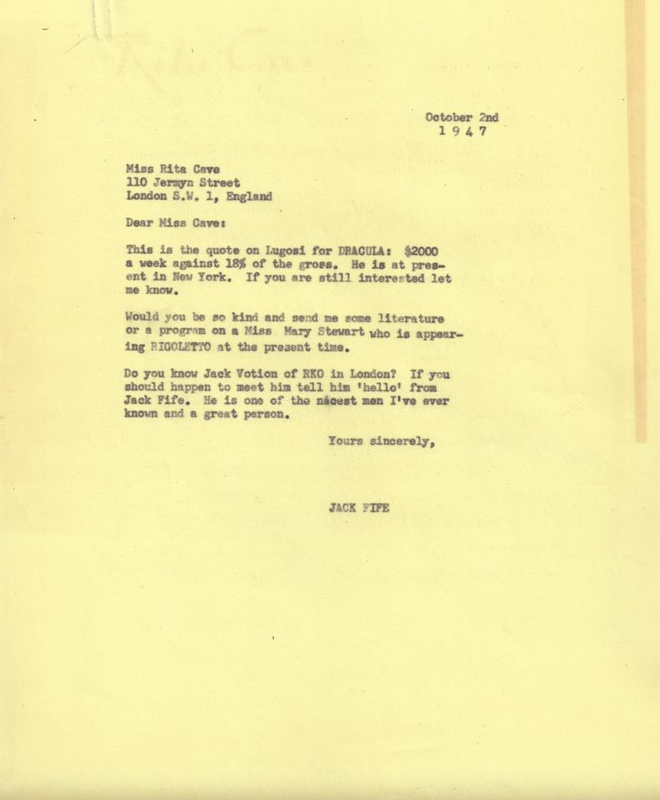 Producer Edward Wood Jr., who is also directing “The Vampire’s Tomb,” with Bela Lugosi as the male star and Vampira as one of the principal players, has arranged for Lugosi to do six more features, the second to be filmed at Sedona, Ariz. This will be a spooky western, as yet untitled, which Wood has written. The Ghoul Goes West was a proposed Ed Wood vehicle for Bela Lugosi who had previously announced the film under the title The Phantom Ghoul on the You Asked For It TV show in 1953. 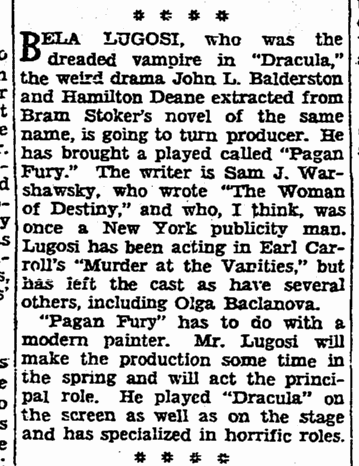 In its April 25, 1955, edition, the Los Angeles Times (See article below) announced that Lugosi had received a copy of the script while in the Metropolitan State Hospital where he was undergoing a ninety-day treatment for his addiction to prescription drugs. 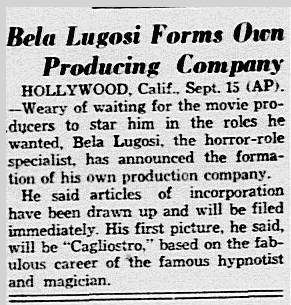 In an August 1, 1955 TV interview, Bela Lugosi said that it would be his first film project after his discharge. Bela Lugosi, whose horror movies never matched the terrors of his 20-year fight against the dope habit, yesterday in General Hospital took a first step toward rehabilitation. The veteran 72 year old portrayer of such characterizations as Dracula, the White Zombie and the Batman had walked into the psychiatric ward of the hospital last Thursday asking for help in his personal fight. Yesterday the medical care he was receiving was augmented by a helping hand from the show business he has been a part of for more than 50 years. He was told arrangements are being made for a lavish Hollywood premiere of the last movie he made, Bride of the Atom, and the proceeds will go to him. The actor was destitute when he committed himself Thursday. And he was given the script for his next picture, The Ghoul Goes West, production of which has been postponed until Bela has recovered entirely from drug addiction and is ready to work again. Bearer of the tidings and the script was Tony McCoy, young producer of Lugosi’s last film, who promised to hold up the shooting of his next one until Bela can star in it. Arrayed behind McCoy when he broke the news to Lugosi were members of both cast and crew of the star’s last film from Director Ed Wood and leading players to property men and grips. Other players who worked with Lugosi in his last film explained why the veteran Hungarian actor star was so popular with the cast and crew. When his general physical condition improves, Lugosi will be transferred to Metropolitan Hospital in Norwalk for completion of treatment. He has explained that he began using drugs 20 years ago because of pains he suffered in his legs and never managed to break the habit. Dracula is going back before the motion picture cameras again. Even as Bela Lugosi awaited release tomorrow from Metropolitan State Hospital, Norwalk, where he has been successfully treated for drug addiction, the one-time Dracula-man revealed that he plans to start work on a new picture August 20. 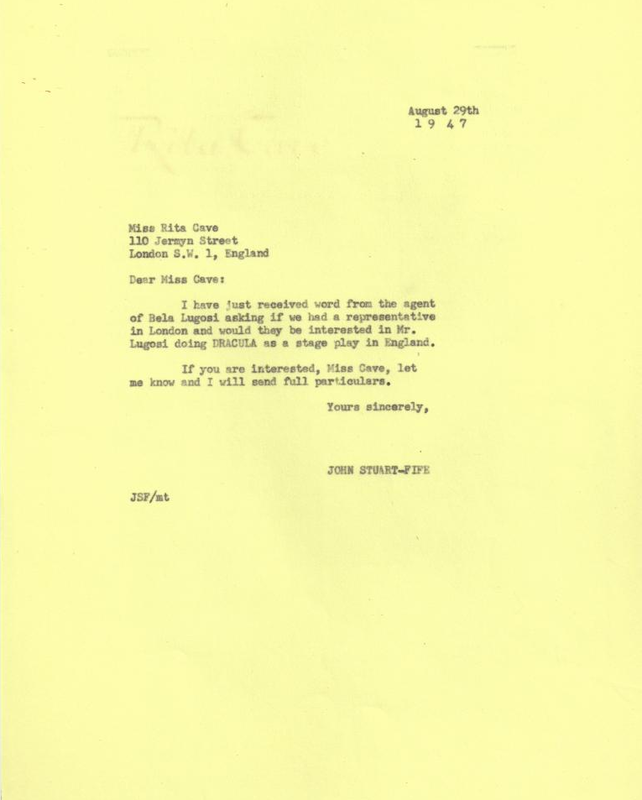 During his three month rehabilitation, while he studied the forthcoming script, Lugosi spoke feelingly of the hundreds of letters he has received from all over the world. People learning of his fight against the dope habit wrote to him from South Africa, France, Turkey, all parts of the United States, even from behind the Iron Curtain. His step, strong and healthy, his voice firm and the familiar eyes as piercing as ever, Lugosi has come back a long way from the addict who barely could walk at the time of his commitment three months ago. The desire to act again plus the letters of encouragement were what helped him over the rough spots. “I could not have done this alone,” he said. Norwalk, Calif. (AP) – Rehabilitated Bela Lugosi will leave Metropolitan State Hospital Friday and start work on a new movie in two weeks. He was treated for three months for drug addiction. The 66-year-old actor, his step firm, his voice firm, and his eyes as piercing as ever, has come a long way back from the emaciated addict who could barely walk when he was committed to the hospital at his request. The friends were the “thousands” who wrote to the movie “Dracula” during his rehabilitation and expressed faith in his ability to overcome the drug habit. “I’m not going to disappoint those people,” Lugosi declared as his picked up his small suitcase and prepared to leave the hospital. He was met there by his divorced wife, Lillian, and their son, Bela Lugosi, Jr., 18. The 66-year-old actor will stay with a nephew. 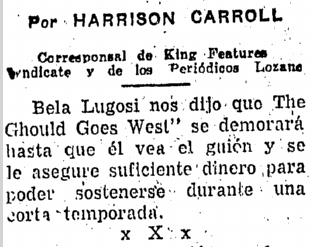 In two weeks, Lugosi will start work on a role in the film, The Ghoul Goes West. He has been studying his part at the hospital. 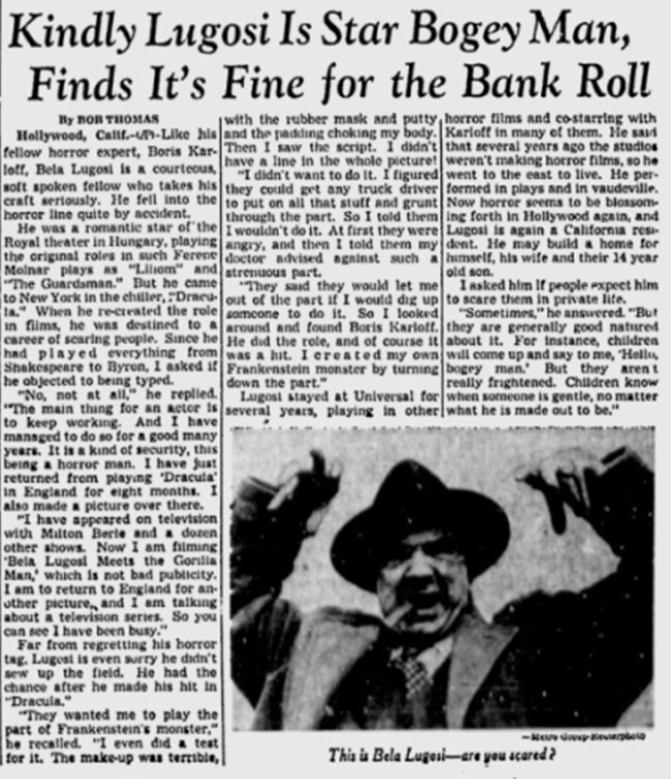 Tuesday Lugosi was pronounced fit to leave the hospital by a board of medical examiners. During his stay he put on 20 pounds and lost the emaciated appearance he had when he entered. Bela Lugosi and Hope Lininger on their wedding day. Back in 1931 a schoolgirl crouched down fearfully in a movie-theater seat in Johnstown, Pa. They were Clark Gable, Ronald Colman and Cary Grant. But this teen-ager had a hero all her own. The ones who applauded and shrilled over Gable, Cooper, Colman and Grant are living comfortable today with guys they met in the audience, not on the screen. The little girl who sat all by herself in that dark theater has seen a strange dream come true. Tonight, Hope Lininger, 40, a cutting-room clerk at RKO Studios, will be married to the dream that other girls her age in 1931 thought a nightmare. Miss Lininger tonight will become the bride of Bela Lugosi, 73, released a few weeks ago from Metropolitan State Hospital at Norwalk, pronounced cured as a drug-addict. In 1931 he was the sinister “Dracula,” a cape-clad vampire, and he never really escaped from such horrendous roles. A type, they said. And that he was. The romance of Miss Lininger and Bela Lugosi is one of the strangest in the history of the movies and the theater. “When I was a little girl, and even when I got older, I didn’t have much to do with boys,” Hope remembers. Hope, whose marriage to Lugosi will be at the home of Manley P. Hall, writer and publisher of books and pamphlets as transcendental as the romance he will sanctify, confesses that she is astounded by the quirks of fate that have brought her to the altar. Hope, who has worked at the RKO studios for 10 years, says she had another personal interest in Lugosi’s destiny. “There was a background in my life of people who suffered from narcotics, the way he did,” she says. 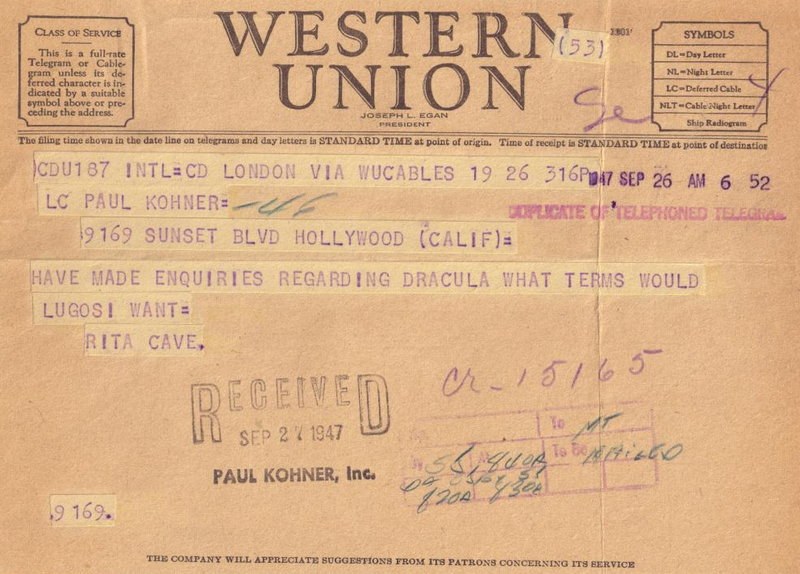 When Lugosi went to Norwalk, Hope started writing him letters. One a day. They were long—sometimes eight pages—and were crowded with the details of what she considered a humdrum life. She never attached her name to the letters. “Just a Dash of Hope,” they were signed. When Lugosi got out of the hospital he searched for Hope. He didn’t know her name. He had only her address. 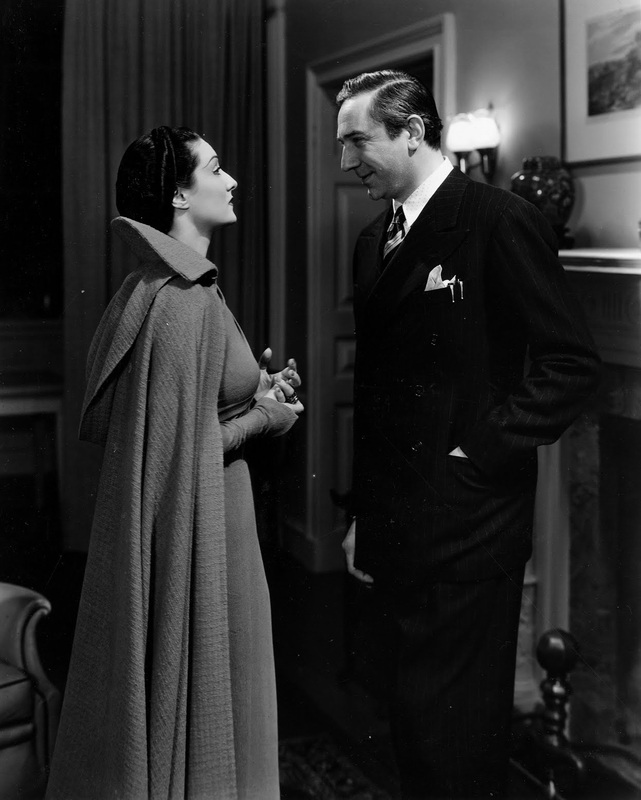 Lugosi, who is as astonished as Hope about their romance and marriage, accounts for it partly because he feels lonesome. 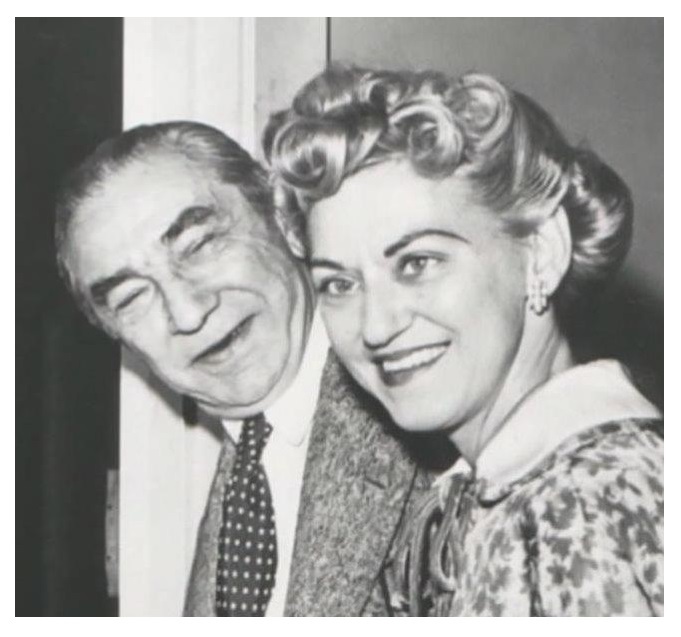 Lugosi confesses to a lingering love for his ex-wife, Lillian, 43, who divorced his in 1953. “It was a terrible history of alcoholism, and finally, addiction to drugs,” the actor says. Lugosi and Miss Lininger obtained their marriage license this morning. The marriage will be performed tonight at Hall’s home before a small group of close friends. They plan no immediate honeymoon but will journey to New York late next month where Lugosi will testify before a subcommittee of the U. S. Senate on drug addiction. He has optimistic expectations that he will soon return to stardom on the screen and is now studying a script, The Ghoul Goes West, which will be produced independently of the big studios. “Just another one of those things,” he calls it. A New York publisher is urging Bela Lugosi to write his memoirs. I love Lugosi and your site! Lots of great insight into the personal side of this great actor. Whatever happened to Bela’s last wife, Hope. ? Is she still living? Has she ever given any interviews about her time with Bela? If she is still with us, I would love to contact her. It seems like she vanished from the face of the earth.